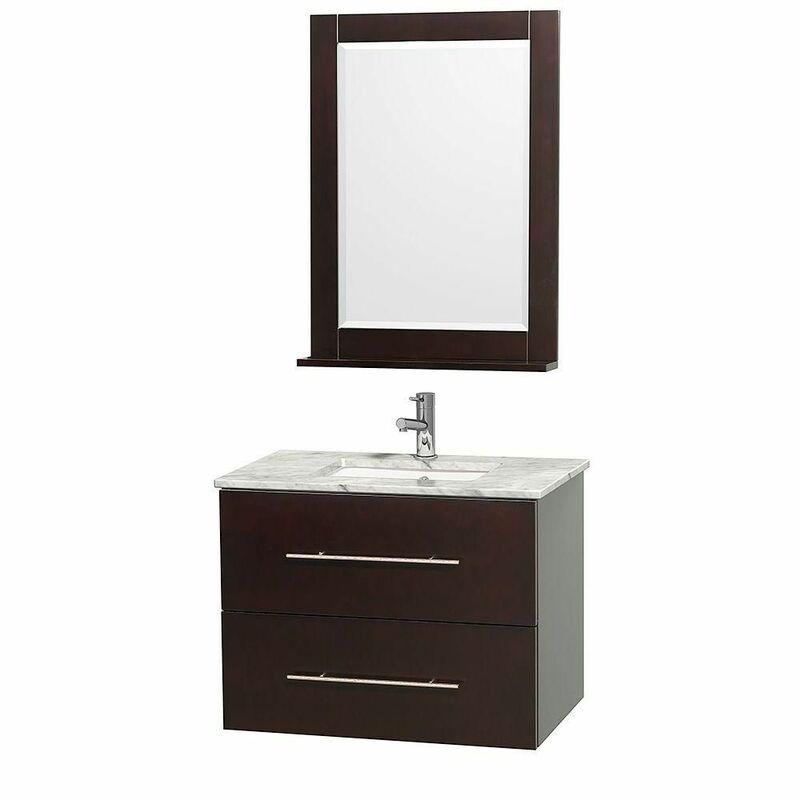 Centra 30-inch W 1-Drawer 1-Door Wall Mounted Vanity in Brown With Marble Top in White With Mirror Bring a fresh, modern look into your bathroom with this vanity. With a white marble counter and brown solid wood base, this product is good-looking and useful. Keep many bathroom items in its roomy drawer and single-door cabinet. This set from Wyndham Collection is great for anyone looking for great style and function in their bathroom. Centra 30-inch W 1-Drawer 1-Door Wall Mounted Vanity in Brown With Marble Top in White With Mirror is rated 4.5 out of 5 by 2. Rated 5 out of 5 by jansoc from Taking a risk pays off BIG! Purchasing this online without ever seeing it in person, was taking a big risk on my part. However, it turned out to be a great decision. First, it was delivered within the timeframe they said. I received a call the day before telling me a two hour window in which it would be delivered. It came well packed on a pallet. Second, it is absolutely beautiful and the construction is top-notch. I gave it an average "Ease of installation" not so much because of the vanity design, but because the the plumbing constraints that existed in my house. That would be my only warning to potential buyers - check out your existing plumbing to be sure that this floating vanity will work. Good news - with a few minor/unexpected plumbing changes, it was installed and looks great. Haven't been able to use yet, waiting for project to be complete.